his mouth but do not hear what he’s saying. 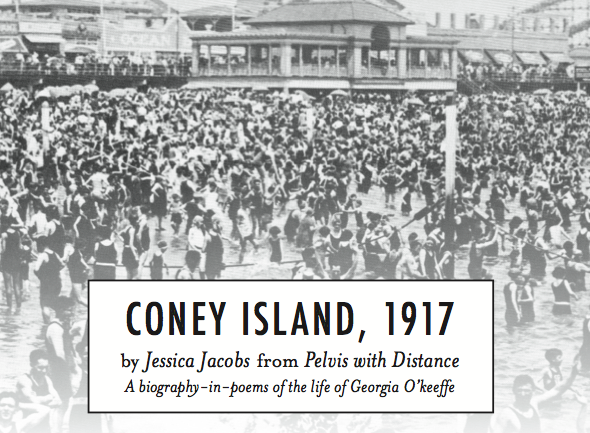 Jessica Jacobs is the author of Pelvis with Distance, a biography- in-poems of the life of artist Georgia O’Keeffe, published by White Pine Press in April 2015. She holds an M.F.A. from Purdue University, where she served as the Editor-in- Chief of Sycamore Review, and a B.A. from Smith College. Her poetry, essays, and stories have appeared widely in publications including Beloit Poetry Journal, The Missouri Review, Rattle, The Oxford American, and The Academy of American Poets’ Poem-a-Day series. An avid long- distance runner, Jessica has worked as a rock climbing instructor, bartender, editor, and professor. Jessica is now serving as faculty at Writing Workshops in Greece, Sewanee Young Writers Conference, and as the 2016 Hendrix-Murphy Writer-in- Residence at Hendrix College in Conway, AR. She lives in Little Rock with her wife, the poet Nickole Brown. Jacobs and Brown will give a reading and seminar with the Poetry Society of SC on NOVEMBER 13-14, 2015 at the Charleston Library Society. Learn more at poetrysocietysc.org. Posted in Literary on October 2, 2015 (Fall 2015) by Matt Mill.